The Chinese new year (Spring Festival, i.e. 3rd Jan 2011) is coming! On the traditional Chinese calendar, year 2011 is called the year of rabbit, while the previous year is the year of tiger. Spring Festival is the biggest holiday in China. Chinese people usually will take a long vacation and come back to hometown, stay with the family, make delicious food, set off firecrackers and visit friends etc. We are going to take one month vacation from next Monday. During the vacation, we will still be there to provide forum/email support. So the only difference is that we don’t release new version during the vacation. 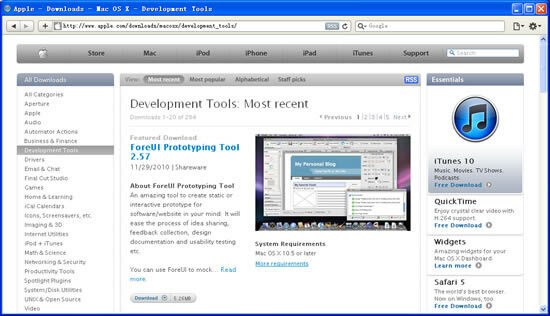 PS: I just noticed that ForeUI has been listed as “Featured Download” item on Apple.com (in the “Development Tools” category). That’s wonderful! Today ForeUI’s first release in Year 2011 is out! Want to know what’s new in V2.65? Please read on. Now you can insert animated GIF files into your prototype, and they will be really animated in simulation! 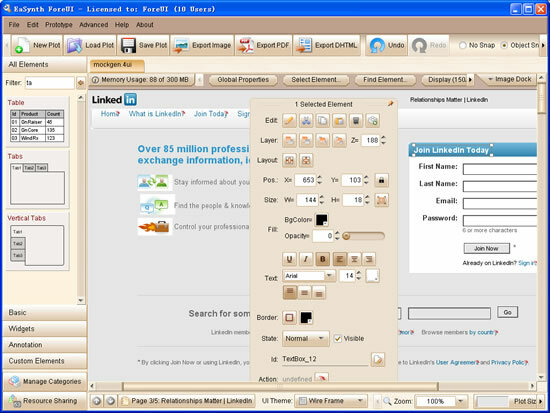 So far there are four types of elements support this feature: Image Box, Window, Tree and Multilevel Menu. With our on-going effort, more elements will support this. 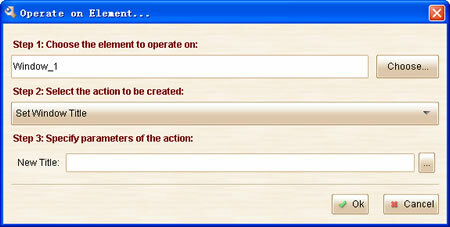 The Window element supports a new “Set Window Title” action, which allows you to change the window title in simulation. The new title supports property, so you can include some dynamic value in the window title. The TextEditBox and Spinner elements now support a new “Set Focus” action, which will set focus on the specific element. This can be used to set the default focused element when page is loaded. Show image button on floating tool pane for MultilevelMenu element. Enable hotkeys for cut/copy/paste/delete on embedded element. Bug_0271: “Mouse Out” event for Multilevel Menu is triggered when mouse is hovering on the element. Bug_0272: The delay value in “Pause a while” window should be selected by default. Bug_0273: Can not start selecting from above of plot. Bug_0274: The title of Window element does not respect the default font settings. Bug_0275: Table column become wider in simulation. Bug_0276: Table column widths should be synchronized in edit/view modes. 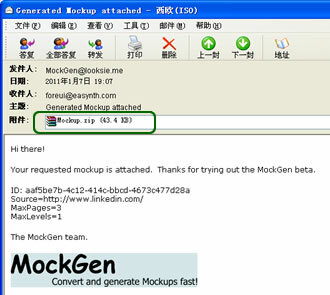 The web page of MockGen is very simple (as shown below). 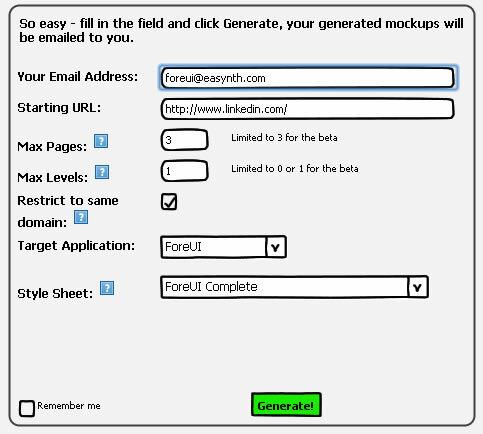 There are just a few input fields to accept the parameters for mockups generation. Some fields have a blue question icon on the right, and you can click the icon to show the explanation of the field. 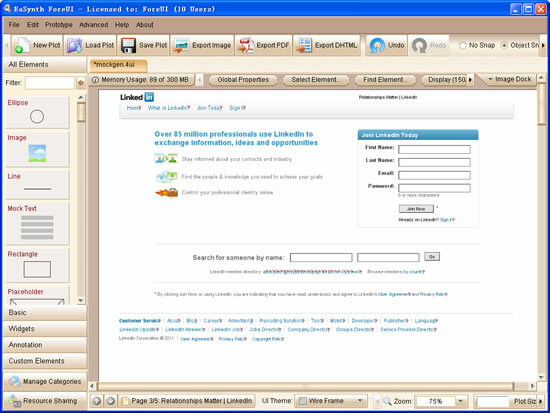 There are just two required fields: one is your email address and the other is the URL of the existed website. 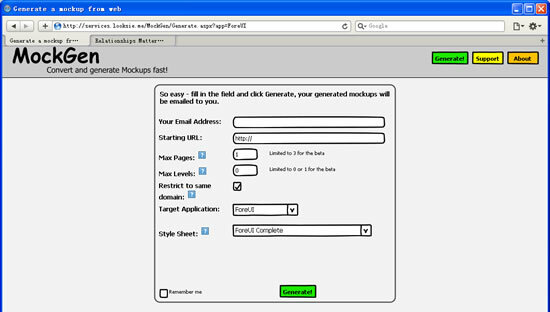 Other fields can control the pages included in mockups, and you can choose the output format (ForeUI plot or Balsamiq mockups). It is better than my expection, an email arrived within one minute and it contains a ZIP archive. The plot file is just in the ZIP archive. 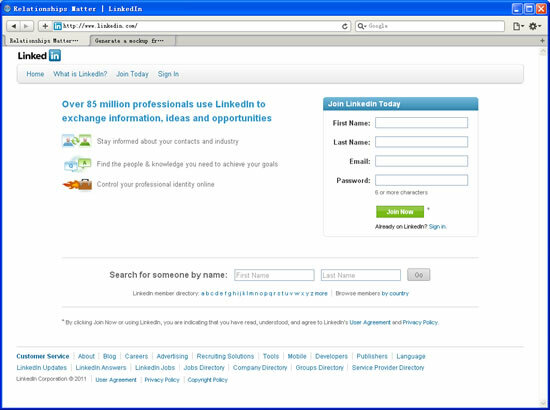 After extracting the file and open the plot in ForeUI, a prototype for LinkedIn website is ready. The first page is a navigating page and it can bring you to any page within the plot when running the simulation. What if we run the generated plot in web browser? I can’t help trying this and below is the comparation. As you can see, there is a little offset between real website and the generated plot. But it is not a big problem and I believe it can be improved in the future, as it is still in Beta state for now.